Irish pops up when you least expect it! When you study a minority language, you’re always looking for evidence that it still exists out there, beyond the classroom or the immersion course. With a language such as Irish, which suffers from an identity crisis here in the U.S. (“Don’t you mean Gaelic?”), and which many Americans seem to think is dead, if they know it ever existed at all (“You mean they have their own language?”), it sometimes surprises me when I encounter it at all. And yet, there it is, popping up when I least expect it. I’ll be the first to admit that most of this “pop-up Irish” is (usually) minimalist, to say the least. 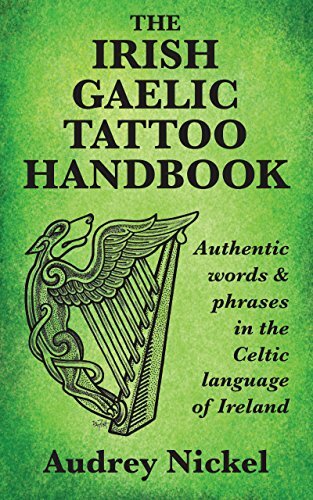 It’s things such as spotting the word “fáilte” among other world languages on a “welcome” poster on the door of an elementary school classroom, or the word “uisce” among other words meaning “water” on a decorative fountain. But every now and then I’ll get a real surprise, such as the time the person in the visitors’ booth in downtown Santa Cruz greeted me with Cén chaoi a bhfuil tú? (“How are you?” in Connacht Irish)* or the time the lady in San Francisco, spotting my An bhfuil Gaeilge agat? (“Do you speak Irish?”) T-shirt, said “Tá neart Gaeilge agam! Is múinteoir Gaeilge mé!” (“I have a lot of Irish! I’m an Irish teacher!”). These are the encounters you live for, and one unexpected Irish encounter such as these can brighten my entire day! Unfortunately, for most of us, they’re too few and too seldom. If you’re an Irish speaker or learner and haven’t seen the wonderful short film Yu Ming is Ainm Dom (“My Name is Yu Ming”), first, have you been living under a rock? And second, you need to see it. Here’s a link: Yu Ming is Ainm Dom. It’s only about 10 minutes long. Go ahead…I’ll wait. It’s relevant. For the next six months he works hard at learning Irish, becoming increasingly more comfortable with the language. Finally the big day comes, and he hops on a plane bound for Dublin. At first he’s pleased and excited to see the signs in Irish all around the airport, on the busses, etc. Things come crashing down, however, when he realizes that no one understands him when he tries to speak it. After days of looking for work and trying to get by, poor Yu Ming decides that he doesn’t have very good Irish after all…until a chance meeting with a man in a bar (played by the wonderful Frank Kelly) reveals that he actually has MORE Irish than most people in Ireland, where English, alas, is the majority language. This story is important, not only because it’s a great short film, but also because it made my most recent Irish encounter all the sweeter. When I’m not speaking in Irish, writing about Irish, dissecting Irish tattoos, or making music, I work as an editor for a market research firm. The people who take part in our survey panels earn points, which they can exchange for PayPal payouts or Amazon gift cards, and one of my jobs is to redeem their points for them. We have panelists from all over the world, but last week was my first time encountering one from China. This person wanted an Amazon gift card. Unfortunately, the Amazon China website is in…well…Chinese. Because of the French and Latin I took in high school and college, I can generally manage navigating Amazon in French, Italian, or Spanish, but Chinese is an entirely different story. I didn’t even know where to start! The layout was also quite different from the Amazon sites I’m more accustomed to, so I couldn’t use that for a guide. I copied blocks of text into Google Translate (see how desperate I was? ), but without the page layout, the fragments I got weren’t of much help to me. Out of frustration, I tried again to use Chrome to translate the page. I got the same message. Then I realized there was a drop-down menu for other languages. I said “I wonder…”. Nah…never happen! But I wonder…”. Famous last words! Sure enough, I chose “Irish” and the page translated with no problem! Was it perfect Irish? No. Far from it (you can see an example in the picture above). But it was readable Irish (and, for me, one heck of a lot more readable than the Chinese), and it was such a surprise, I swear they could hear me laughing in China! Never let anyone tell you that Irish is a “dead” or “useless” language. It’s out there, and we should treasure every opportunity we have to speak or read it. And somewhere in Connemara, I think, someone named Yu Ming is smiling. * Venus, the lovely person who runs the information booth in downtown Santa Cruz, has tried to learn basic greetings in as many languages as possible. She saw my harp necklace and guessed that I was Irish. Sure took me by surprise, and she had good pronunciation to boot! Previous Previous post: Welcome Springtime!